Casa María welcomed a new addition to the community to replace an item that, quite literally, ‘poorly sucked.’ A new Dyson vacuum model DC33, purchased from Sears at Ingram Mall, officially took over vacuuming responsibilities from the 13-year old Powr-Flite model PF14 on Saturday morning, October 9. 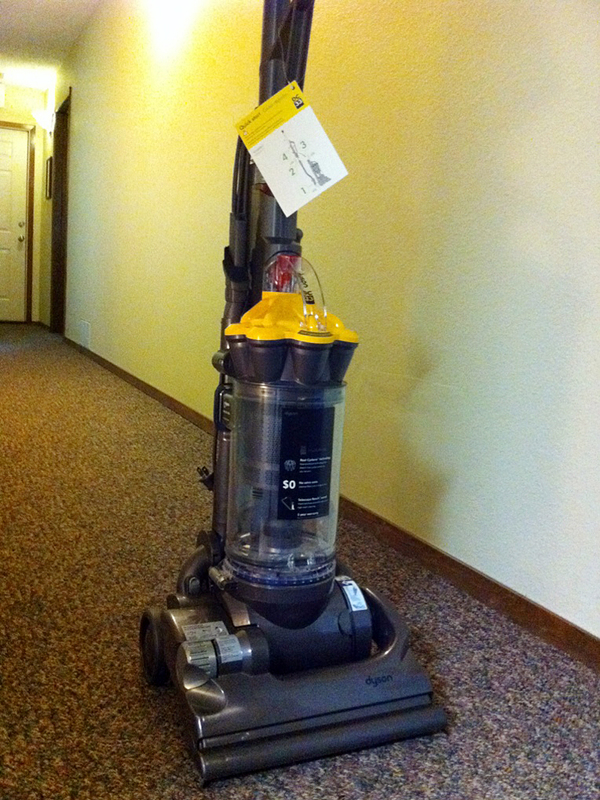 After noticing that the vacuum began underperforming in its primary duties of cleaning community floors and carpets, the brothers discovered that the Powr-Flite exhibited a number of problems that warranted a complete replacement–after all, the vacuum is over a decade old. Featuring washable filters, bagless dust bin, 15-foot hose, 5-year warranty and light-weight, easy-to-use, handling, the Dyson promises to offer faithful service to the community’s mission in the years to come. This entry was posted on October 9, 2010 at 6:50 pm and is filed under Community News. You can subscribe via RSS 2.0 feed to this post's comments. Both comments and pings are currently closed. The new vacuum just goes to show that that Casa Maria is so connected to Marianist history. Wasn’t it the Brodeaux Sodality that took on the mission of ministering to the young chimney sweeps? The mission continues…. That’s true, Bob! We miss you and your insightful quotes! Know of our prayers and blessings! that’s a schnazzy vacuum cleaner! Make sure you don’t take it outside though – Nature abhors a vacuum.